(Compiled by Dr Ane Buchner – Paediatric Oncologist). Leukaemia, or blood cancer, is a type of cancer that starts in the bone marrow where blood cells are produced. During this process of producing blood cells, abnormal cells sometimes develop. The body has various ways of getting rid of these abnormal blood cells before they start multiplying. However, when these mechanisms fail, one abnormal white blood cell can start multiplying uncontrollably and then becomes a group of fast multiplying leukaemia (blood cancer) cells. These cancer cells spill out of the bone marrow into the blood and leukaemia is therefore called blood cancer. In most cases it is not known why a developing blood cell becomes abnormal and why the body’s control mechanisms fail to get rid of the abnormal cells. However there are some known risk factors for leukaemia like previous high levels of radiation, previous high doses of chemotherapy, exposure to certain chemicals like benzene, and some genetic conditions like Down’s syndrome. Leukaemia is not an inherited condition, and cannot be transmitted like an infection. In ALL, the cancer cell starts from an immature white blood cell called a lymphoblast. These lymphoblasts continue to multiply rapidly in the bone marrow and then spill into the blood. It is called “acute” because it usually develops quickly and becomes worse within weeks if not treated. How common is ALL in children? Most cases of ALL occur in children (about 6 in 10), and ALL is the most common cancer in childhood. It is more common in boys than in girls, and can affect children at any age but commonly between ages 4 and 7. 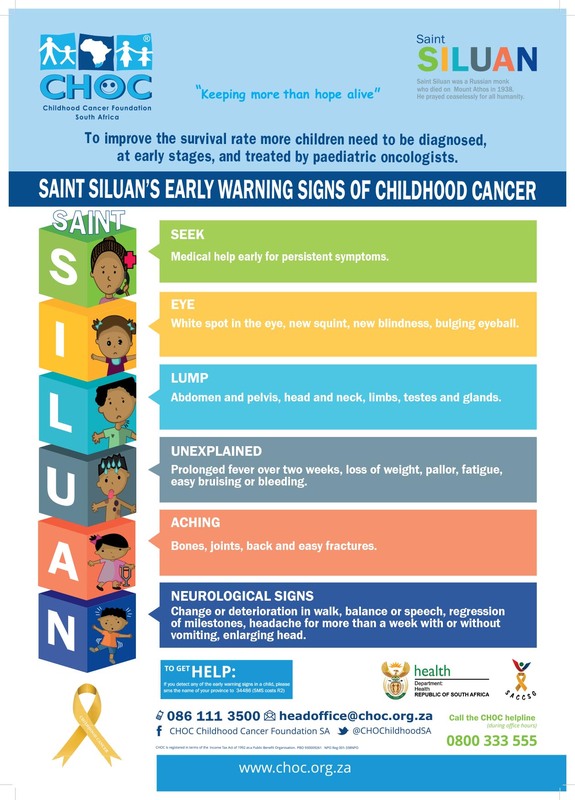 In South Africa approximately 205 children are diagnosed with ALL every year. What are the symptoms and signs of ALL? Anaemia: With fewer than normal red blood cells the child looks pale, and can be tired and breathless. Bleeding: Low platelets can lead to problems with blood clotting, so the child may bruise easily, have nosebleeds or bleed from the gums. Serious infection: Due to low numbers of functioning white blood cells the body cannot fight infection. The child can then get different types of infections, often with high fever. Other symptoms can include swollen glands (anywhere in the body), a swollen or distended stomach due to enlargement of the spleen and/or liver, persistent fever, weight loss, and bone or joint pain. When a doctor suspects leukaemia, the first test will be a blood test called a full blood count. This will likely show low numbers of normal blood cells (red blood cells, white blood cells and platelets), and may show the abnormal lymphoblasts. If the full blood count is suspicious, it is usually followed by a bone marrow test to confirm the diagnosis. During this test, a small amount of bone marrow and sometimes a small piece of bone is removed from the pelvic bone at the back, using a needle. This is done with good sedation (the child is given medicine to sleep and numb the pain during the procedure). The samples are studied under the microscope and tested using special techniques to confirm the diagnosis of leukaemia. A lumbar puncture will then be done to examine the fluid that circulates from the brain for leukaemia cells. This is done to find out whether the leukaemia has spread to the brain and spinal cord. Can children with ALL be treated? Without treatment, ALL usually leads to death within months. However, ALL can be treated using chemotherapy to kill all the abnormal cells. Sometimes the chemotherapy treatment is combined with radiotherapy and sometimes stem cell transplant may be needed. The chemotherapy regimen used will depend on the exact type of ALL diagnosed. Other factors like age, gender, number of abnormal leukaemia cells in the blood, chromosomal changes in the leukaemia cells, infiltration of leukaemia into the brain, and the initial response to treatment may influence the regimen used. All chemotherapy regimens are based on research trials done to determine the most effective type of treatment with the fewest possible side effects. Most children will be in remission soon after starting treatment. This means that no more abnormal cells are seen in the blood or bone marrow. However, there may still be cancer cells elsewhere in the body. To kill all the cancer cells and keep the leukaemia from retuning, the full treatment course needs to be completed. This usually takes about two to three years. What is the prognosis for children with ALL? In general, most children with ALL (about 70-80%) can be cured. This has improved greatly over the past 20-30 years. It is however important to remember that each child’s leukaemia is different and that certain factors need to be taken into account when discussing the outlook. In AML, the cancer cell starts from an immature white blood cell called a myeloid stem cell. These cells continue to multiply rapidly in the bone marrow and then spill into the blood. It is called “acute” because it usually develops quickly and becomes worse within weeks if not treated. How common is AML in children? AML is rare in children, and more commonly occur in adults over the age of 50 years. In South Africa approximately 75 children are diagnosed with AML every year. What are the symptoms and signs of AML? Serious infection: Due to low numbers of functioning white blood cells the body cannot fight infection. The child can then get different types of infections, often with high fever. Other symptoms can include swollen glands (anywhere in the body), a swollen or distended stomach due to enlargement of the spleen and/or liver, persistent fever, weight loss, and bone or joint pain. When a doctor suspects leukaemia, the first test will be a blood test called a full blood count. This will likely show low numbers of normal blood cells (red blood cells, white blood cells and platelets), and may show the abnormal blast cells. If the full blood count is suspicious, it is usually followed by a bone marrow test to confirm the diagnosis. During this test, a small amount of bone marrow and sometimes a small piece of bone is removed from the pelvic bone at the back, using a needle. This is done with good sedation (the child is given medicine to sleep and numb the pain during the procedure). The samples are studied under the microscope and tested using special techniques to confirm the diagnosis of leukaemia. A lumbar puncture will then be done to examine the fluid that circulates from the brain for leukaemia cells. This is done to find out whether the leukaemia has spread to the brain and spinal cord. Can children with AML be treated? Without treatment, AML usually leads to death within months. However, AML can be treated using chemotherapy to kill all the abnormal cells. The chemotherapy regimen used will depend on the exact type of AML diagnosed, and sometimes chemotherapy treatment is combined with a bone marrow transplant. Factors like age, gender, number of abnormal leukaemia cells in the blood, chromosomal changes in the leukaemia cells, infiltration of leukaemia into the brain, and the initial response to treatment may influence the treatment regimen used. All chemotherapy regimens are based on research trials done to determine the most effective type of treatment with the fewest possible side effects. Most children will be in remission soon after starting treatment. This means that no more abnormal cells are seen in the blood or bone marrow. However, there may still be cancer cells elsewhere in the body. To kill all the cancer cells and keep the leukaemia from retuning, the full treatment course needs to be completed. This usually takes about six months. What is the prognosis for children with AML? The outlook for AML in children has improved over the past 20 years. About 50-60% of children with AML can be cured using a combination of intense chemotherapy and bone marrow transplant for the higher risk patients. It is always important to remember that each child’s leukaemia is different and that many factors need to be taken into account when discussing the outlook. Wilms tumour or nephroblastoma as it is more commonly known is the most common renal malignancy in children. The annual incidence of renal tumours is about seven cases per million in children younger than 15 years of age. Two thirds of the cases of Wilms tumours are diagnosed before the age of five. Wilms tumour accounts for approximately 6% of all childhood malignancies. Nephroblastoma can originate or affect one or both of the kidneys at the same time. Wilms tumour is associated with several congenital abnormalities (genetic or inherited abnormalities). Children that developed bilateral or are affected in both kidneys are more likely to have an inherited or a genetic abnormality. Although this is not always the case. It is generally accepted that Wilms tumours are caused by abnormal renal or kidney development. This abnormal development results in growth of atypical, primitive tissue in the kidney. This abnormal growth does not function like normal kidney tissue and grows rapidly, compressing the normal tissue. Wilms tumour can spread to the surrounding tissue or enter the blood stream and form metastatic tumours in the lungs and even the brain. Most children present with a hard abdominal mass or swelling. This can also be an incidental finding when a child is examined for an unrelated condition. More often than not there is no pain associated. Some children may however present with mild abdominal pain or haematuria (blood in urine), fever or high blood pressure. Tumours that have started to bleed or rupture can cause acute abdominal pain and will require urgent medical attention. Once the diagnosis is suspected a series of tests will be conducted to confirm the diagnosis. These tests will include an ultrasound examination of the abdomen, this is where ultrasound is used to visualise organ structures in the abdomen. This investigation is not diagnostic but will certainly tell the doctor that there is a mass originating from the kidney. The next important test is an abdominal CT scan. This will show a typical mass originating from the kidney and in most cases this can be diagnostic. Doctors may not request to a biopsy if there is any doubt about the diagnosis. A biopsy is where a small needle is placed through the skin and into the tumour and a small piece of the mass is removed. This is then examined under microscope and a final diagnosis of nephroblastoma is confirmed. A chest x-ray is a valuable tool to exclude any spread of the tumour to the lungs, blood test are performed to make sure it is safe to proceed with chemotherapy. A common question that is often asked by patients as soon as they are diagnosed is what the stage. Staging a nephroblastoma is complicated. The size, spread and nature of the tissue is assessed to determine the stage. Stage I: is where the tumour is confined to the kidney and is engulfed in a capsule. Stage III: is when after surgery some tissue remains behind is confined to the abdomen with no spread to the lungs or to the lymph nodes. Stage IV: is when after surgery there is evidence that the tumour has spread via the blood system. The tumour may be positioned in the lung, liver, bone or even the brain. Stage V: is when both kidneys are involved, each kidney is staged separately for example you can have a stage V Wilms tumour with stage II, left and the stage I, right kidney tumour. Once the kidney has been removed surgically it is examined and the nature of the tumour cells are assessed based on the tumour cells. The tumour is classified as a high-risk, standard risk or low risk tumour. Wilms tumour is treated with a combination of chemotherapy, surgery and on occasion radiotherapy. Neoadjuvant therapy (this is where chemotherapy is given prior to surgery) is offered to patients with Wilms tumour. This is chemotherapy that is given 4 to 6 weeks prior to surgery with the aim of reducing the size of the tumour and limiting the possibility of spread, this also done to test the sensitivity of the tumour to chemotherapy. Following this children undergo surgery whereby tumour and often the effected kidney is removed. The post-operative staging determines what adjuvant chemotherapy will be offered. Depending on the stage and risk this can range from 4 to 34 weeks. At the end of treatment children are followed up for an extended period of time to make sure that the tumour does not return. Care is also taken to assess if there are any long-term side effects from the treatment. At these visits children will receive a thorough clinical exam, have a chest x-ray and an abdominal sonar, blood pressure will be monitored and kidney function tests will be performed. Certain children that have received prolonged courses of chemotherapy will also have heart sonar every five years following the completion of treatment. Wilms tumour is one of the most common solid tumours occurring in children between ages of four and six years of age. It can affect one or both kidneys. Provided it is detected early and managed correctly it can be cured. There are some syndromes that will need closer follow-up and monitoring as children with these conditions have an increased risk of developing Wilms tumour.